BEACH SAND CLEANING RAKES sift rocks, shells, tarballs, glass, and other debris from sand. Mini-Tines quickly rake sticks, contaminated seaweed and other large oil soaked debris from beach sand. Auto-sifting feature doubles productivity and eliminates excess sand removal. They are the ultimate beach cleaning hand tools and are used on beaches from Florida to California. 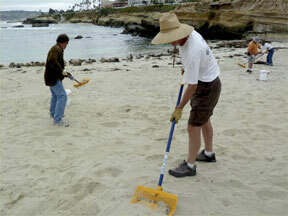 Shake'n Rake outperforms all other beach cleaning hand tools. Mini-Tine 5/16ths inch tine spacing optimized for sifting. Leaves the sand on the beach! Capture oily debris, glass, tar balls, cigarettes, tree bark and needles, animal waste, shells and bottle caps. Equi-Tee sand cleaning rakes are the standard by which all other sifting hand tools are judged! Available in two standard screen sizes sizes (and optionally with finer screens), they will efficiently sift debris down to 1/4 inch. They can be manually agitated or come equipped with an integral motor to auto-sift the beach sand. They are mounted to a full length fiberglass shaft with a comfortable ergonomic grip. They are chemical, oil, salt and heat resistant making them ideal as a beach sand cleaning product. Equi-Tee Shake'n Rakes function as sand rakes, forks, shovels and screens, eliminating the need to carry multiple sand cleaning tools. It is unnecessary to have one worker shovel up the goo and sand, only to dump it into another workers screen, and then into a bag. With these tarball sifting rakes, one worker can do it all! There are no other beach cleaning tools that will sift sand and pick small oil soaked debris as effectively as our Mini-Tine forks and the auto-sifting Shake'n Rake is the only hand tool of its kind in the world, eliminating virtually all excessive sand removal. 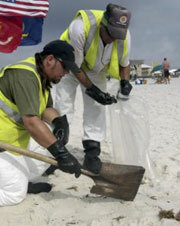 Include them both as part of an effective beach cleaning program or oil spill contingency plan. 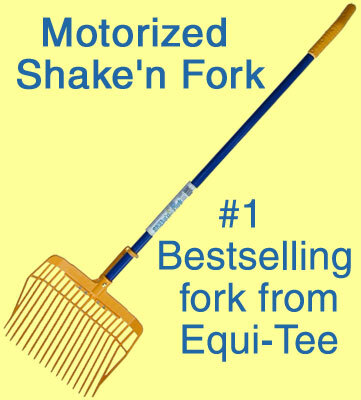 Equi-Tee Rakes are patented (7,222,899) and are sold worldwide. They have been used and proven in the agricultural industry for sifting horse waste from stalls and cleaning outdoor pastures, in golf courses for sifting bunker sand as well as for recreational lake shoreline cleaning where debris or seaweed removal is required. The patented (7,222,900) Shake'n Rake is a purpose built version incorporating an auto-sifting function, a screened basket design, a larger standard battery pack and additional modifications for the sand environment. 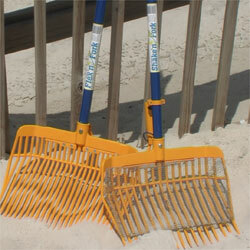 Equi-tee rakes function well as forks and are used to incorporate oil bio-remediation bacteria into beach sand. Governments, cleanup agencies, hotel and beach managers can utilize this beach sand sifting tool to help make beach cleanup more effective. Order yours today. The Equi-Tee Flex'n Fork with a Mini-Tine(tm) basket is the most effective way to manually clean debris such as sticks, seaweed, animal waste, rocks, shells, tree debris and tar balls from wet or damp beach sand. If the sand is dry, a screened Shake'n Rake version removes the need to manually agitate at all. Both beach sand cleaning rakes quickly and easily separate the sand from the oil or other debris so that all you dispose of is the contamination, leaving more clean sand on the beach. Equi-Tee Manufactures these specialized forks with an optimized tine spacing of only 5/16 of an inch apart. The screened versions have optional 1/4 inch or 3/8 inch screen sizes and smaller versions special ordered down to 1/16 of an inch! The patented Mini-Tine forks pick up the smallest tarballs, yet lets the beach sand sift through. With a full length handle it ends the continual stooping to pick up debris, and allows beaches to be quickly and effectively cleaned of oil and contaminates. Order yours today. The motorized Shake'n Rake is for cleaning large expanses of beach that would be nearly impossible to do by manually sifting. It is similar the Flex'n Fork but an integral motor automatically performs the function of manually sifting the sand, so all the operator needs to do is hold the grip and squeeze the variable speed trigger. It incorporates rechargeable Lithium Ion batteries and a small motor with variable speeds to gently agitate the tines without breaking the debris. This automatic sifting function speeds the process of cleaning while greatly reducing the effort required to manually sift. An additional benefit of the powered Shake'n Rake is that with most screened tools, damp sand will not flow through a the screen. However, because this is a powered fork, the sand easily sifts through. When it is used in dry sand it is beach sand cleaning magic! Although this motorized version can be used with dry or damp sand it should not be used for wet sand or in the water. Order yours today. Order the screened and powered Shake'n Rake here for only $349.00 $249.00. Order the screened Flex'n Fork here for only $128.95 $94.95. SPECIAL THANKS TO CROWDER GULF FOR THEIR HELP IN THE GULF !!! Cleaning beaches by hand is a labor intensive and tedious process, especially when picking up tarballs using the traditional hand tool selection of heavy shovels, rakes, screens and bags. Using these tools is terribly inefficient, uses manpower ineffectively and often generates a mountain of garbage bags mostly full of clean beach sand and only a small percentage of oil. Imperfect Method 1: Worker one scoops up small tarball with a shovel. Along with the tar comes two cups of clean sand which is dumped into the bag worker two is holding. After 3 or four scoops, the bag has reached its recommend fill level and set aside for disposal. Many bags hold less than 10% of their contents in tar balls so excessive bags are filled with minimal beach remediation. Abysmal Method 2: Worker one scoops up the tarballs and sand with a shovel and dumps it into worker two and three's screen. These workers proceeds to manually agitate the screen, then dumps the remains into the bag that worker four is holding. Neither worker one or worker four can perform any faster than worker two and three can sift. Although this method puts a higher percentage of oily debris into the bag, it does so at a terrible cost in manpower with the four men working to pick up one small tarball. Better Practices Method! Worker one places his bag on the ground, open end up. Using his lightweight Equi-Tee Mini-Tine sifting fork he scoops up the tarball and sand. By manually agitating the tines, the optimal narrow tine spacing of the fork allows the sand to sift through, leaving mostly debris and tar balls in the basket. He disposes of the tarball into the bag, picks up the bag, and moves to the next location. Best Practices Method! Worker one uses his Equi-Tee Shake'n Fork to gather the tarballs and sand into a row or pile. He then uses the auto-sifting function to quickly and effortlessly sift virtually all the sand from the tarballs. The oil is dumped into a bag, with a far larger percentage of the contents being tarballs. Ideally the Shake'n Fork operator should be part of a four person team, where two other workers are gathering the oily sand into piles or rows. Then one worker holds the bag open and the other sifts out the sand and deposits the oil into the bag. If a large bucket or container were used, bag use could be eliminated altogether. With our specialized Mini-tine fork and powered Shake'n Fork, the same number of workers can clean far more efficiently, picking up many times more the beach area in the same amount of time. In addition the volume of sand waste is greatly reduced, making this waste easier to transport, store and eventually dispose of. Founded in 1998 as an offshoot of Equi-Tee Farm and Fence, the company has already developed other well-known agricultural and forestry accessories such as Equi-Tee horse fencing and Max-flow air filters. Inventor Joseph Berto and his wife operate a horse breeding and training facility in Oregon and when it became clear that there was a need to improve the beach cleaning tools available, Joseph used the resources of the company to develop and test the Equi-Tee Sift'n Forks. 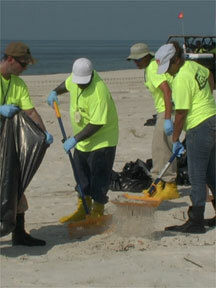 The beach cleanup hand tools are manufactured and assembled in the USA by Equi-Tee Manufacturing. Equi-tee Manufacturing is located in Medford, Oregon and operates injection molding machines using our own tooling. All of the assembly is done in house. These forks have been sold worldwide and are known for their durability and ease of use. Equi-Tee forks can be shipped via UPS to any location in the USA, FOB our warehouse. Except for attaching the basket, they are fully assembled. Larger quantities can be shipped on a pallet via truck. - They are the remnants of crude oil dumped into the ocean by marine vessels or, in this case, by a the B.P. Deepwater Horizon's blown-out undersea well. They are "little, dark-colored pieces of oil that stick to our feet when we go to the beach," according to the National Oceanic and Atmospheric Administration. - During the initial stages of a spill, the oil will spread into a thin slick, leaving it susceptible to tearing by wind and wave action. The smaller patches that result often disperse over a wide area and some of the crude mixes with water to form an emulsion that looks like chocolate pudding. - This mix is thicker and stickier than the original oil in the spill, but it can still be torn by wind and waves. The smaller pieces it breaks into are tar balls. _ They can be as big as pancakes but are mostly coin-sized, according to NOAA. - "For most people, an occasional brief contact with a small amount of oil, while not recommended, will do no harm. However, some people are especially sensitive to chemicals, including the hydrocarbons found in crude oil," it said. "They may have an allergic reaction or develop rashes." - Sea turtles are known to eat tar balls. Dr Gilly Llewellyn, the Oceans Program Manager for WWF-Australia, a conservation group, said tar balls can "attract a curious or hungry turtle" with often fatal results. - Tar balls can also heat up and ooze into the sand, fouling crucial nesting habitat for turtles, said John Hocevar, the Oceans Campaign Director for Greenpeace USA.